Is the Vikings defense fixed? Since the debacle in Los Angeles, the Vikings defense has sprinted into the bye week allowing an average of 16 points through a five-game stretch (4-1). The defensive approach has been the biggest difference, according to head coach Mike Zimmer, since surrendering 556 yards and 38 points to the Rams — both career low points in Zimmer’s 4 1/2-year tenure with the Vikings. Lions offensive coordinator Jim Bob Cooter took a couple pages out of Rams coach Sean McVay’s playbook, and failed to capitalize on similar-to-exact concepts in the Vikings’ 24-9 win on Sunday. 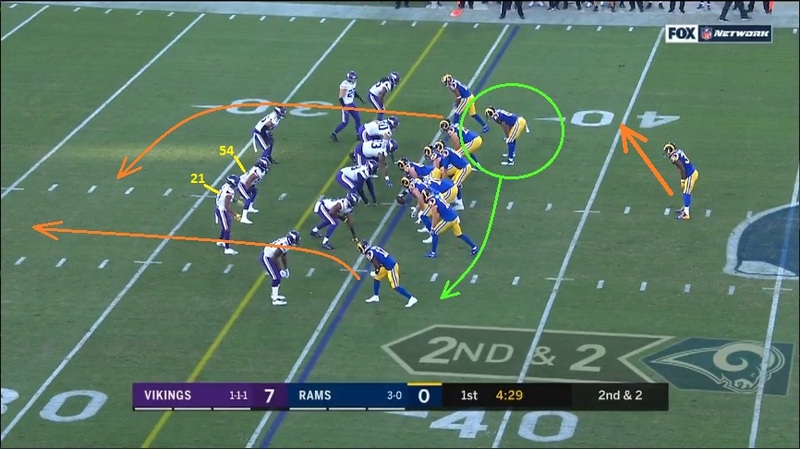 That includes the play design that sprung Todd Gurley for an 8-yard touchdown catch against linebacker Anthony Barr earlier this season. Five weeks later, the result was much different for Detroit. Below we’ll break down the Vikings defense from the win, focusing on the adjustments. We’ll review the Vikings offense next Tuesday heading into the Nov. 18 game in Chicago. 1. Pressure report: The Lions’ trade of receiver Golden Tate, who led Detroit with 44 catches and averaged 6.6 yards after each catch, took a safety valve out of Matthew Stafford’s view. It’s a critical element in why Stafford looked like he had no quick option while taking 10 sacks — a Vikings franchise record. The Vikings could play a lot more man-to-man coverage without fearing the matchup problems Tate created. Zimmer leaned coverage over pass rush vs. the Lions. The Vikings blitzed just five times on 51 dropbacks (9.8%), with nine of the 10 sacks coming from a four-man rush. On many of those plays, Stafford didn’t have anywhere to throw. On some, Stafford was clearly rattled and didn’t get the ball out in time. The Vikings stopped the run effectively (Lions backs held to a 2.6-yard average), leading to Sunday’s dominant day by the defensive line. 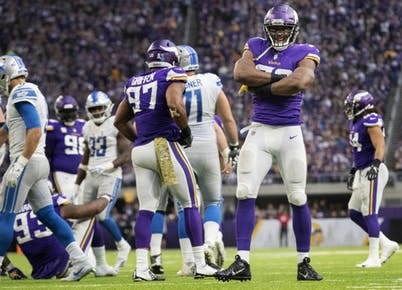 You won’t see many better games than the one Danielle Hunter put together. Aside from his 3.5 sacks and 32-yard fumble returned for a touchdown, Hunter sniffed out a screen for a 1-yard gain and had the tackle on the third-and-1 run stop. Pro Football Focus credited six pressures apiece to Hunter, Everson Griffen and Sheldon Richardson. However, defensive tackle Tom Johnson might have had his best game in 4.5 years for Minnesota. Johnson (2.5 sacks, three tackles for a loss) wiped out two Lions screens and had a relentless effort admirable of the 34-year-old. Stephen Weatherly also stood out off the bench with a sack, another hit on Stafford and a run stop. It didn’t matter if Lions tackle Taylor Decker was in the game or injured and replaced by Tyrell Crosby, because the Vikings D-line dominated. Griffen looked to have some of his old burst again. He slipped by Decker for a 1-yard run stop early in the game. Griffen then had a quick 2nd-and-goal pressure that forced a Stafford throwaway in the first half. 2. Linebackers Eric Wilson, Eric Kendricks and Ben Gedeon covered very well, and made the absence of Anthony Barr a bit of an afterthought against the Lions. The entire Vikings secondary covered well in this game, but let’s focus on the linebackers here. Adjustments have included moving linebackers into more advantageous positions to win in coverage. For instance, the Lions went empty backfield with five wide on a 2nd-and-10 at the Vikings’ 12-yard line. Detroit put its tight end and running back on the far outsides with all three receivers in the slots — which could’ve been a matchup problem for the linebackers. 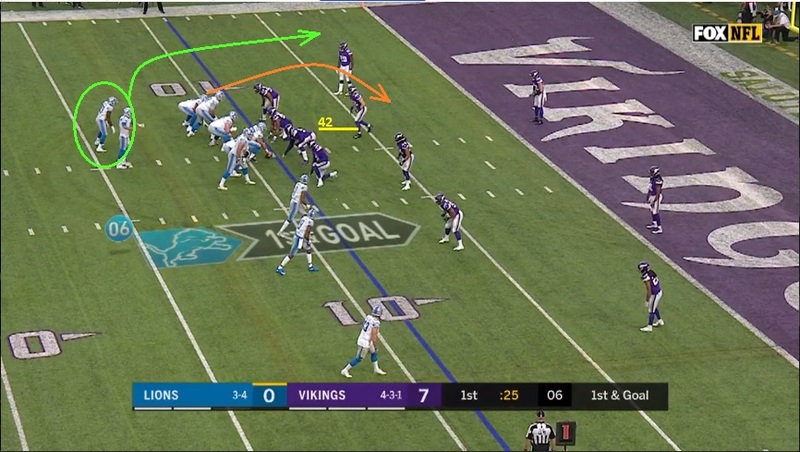 The Vikings simply matched up man-to-man in a Cover-1 scheme, letting Kendricks align far to one sideline on Kerryon Johnson and safety Harrison Smith on the opposite sideline to cover the tight end. Trae Waynes, in the right slot, latches onto Stafford’s first read and the play ends in a sack by Hunter and Griffen. Wilson (90%) was the primary nickel linebacker next to Kendricks, however Gedeon (34%) mixed in late in the game. Wilson had stellar coverage on Lions running back Theo Riddick that led to Stafford’s throwaway on 1st-and-10 in the red zone. Gedeon was also in great position on an incompletion to Kerryon Johnson in the end zone. 3. Anatomy of a play: Throughout the first quarter, the Lions weren’t very shy about mimicking the Rams. Below, you’ll see the 13-yard catch by Rams tight end Gerald Everett. The Rams destroyed the Vikings with play-action passes like these, and the Lions — with a newfound running game in Kerryon Johnson — tried to exploit the same weaknesses. Everett runs left, against the play-action run right, and comes free while rookie cornerback Mike Hughes (#21) and linebacker Eric Kendricks (#54) hesitate reading run and then getting caught in the vertical route in front of them. The result is an easy pitch and catch from Jared Goff to Everett as the Vikings scrambled to identify and catch up to the misdirection. On Sunday, the Lions went into hurry-up mode the second they saw the Vikings in the 4-3 base defense. Detroit tried to catch the Vikings with the exact same compact 2-by-2 formation using the same Rams play. A small Vikings adjustment is made. Kendricks (#54) is typically the middle linebacker in their 4-3 base, but this time he aligns outside and is better positioned to use his speed to cover Lions tight end Michael Roberts (circled in green). It’s excellent coverage by Kendricks on a play they had been burned on just a month earlier. Stafford still tries to squeeze the pass into Roberts, but it’s incomplete. Zimmer referenced the Gurley touchdown as a “scheme thing” the Rams used to beat the Vikings. That “scheme thing” was Barr getting beat. 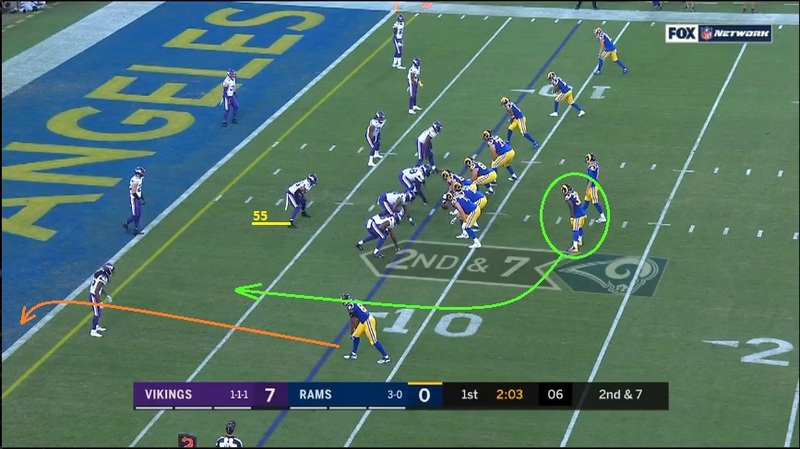 Below, you’ll see Gurley’s wheel route against linebacker Anthony Barr (#55) in man-to-man coverage. Out of a 3-by-1 formation, Goff looks to the weak side for an 8-yard touchdown to Gurley. On Sunday, the Lions used a similar 3-by-1 formation, but made a minor adjustment by aligning the “1” (orange) tighter to the offensive line to run a pick route that gets in the way of Gedeon (#42), knowing he’d have man-to-man coverage on the running back in Johnson (green). Gedeon takes a great angle, keeps his eyes on the running back and puts an arm in between Johnson’s hands to prevent a touchdown catch. 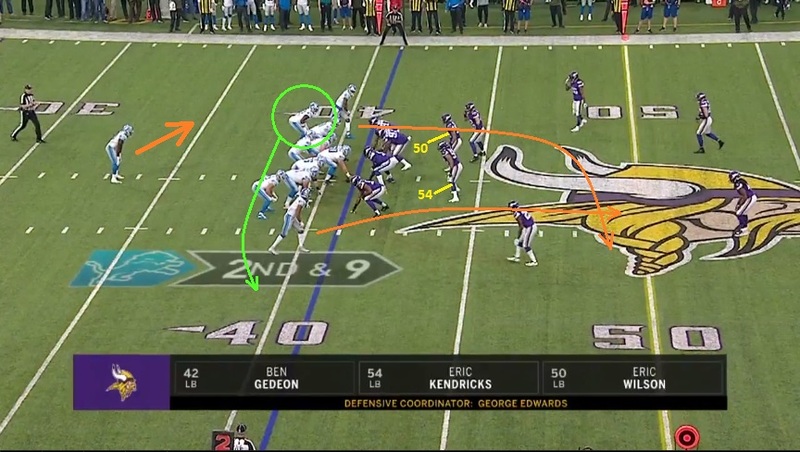 This is one way the Vikings have changed which defenders are doing what, with credit to Gedeon for great coverage. The Vikings again remained in the 4-3 base defense here, moving over linebackers Kendricks and Wilson to the 3-receiver side of the formation. 4. The Lions didn’t have a play over 20 yards, in part because the Vikings mostly kept both safeties deep. Safeties Harrison Smith and Anthony Harris both aligned deep on 12 of 20 first downs before the Lions’ final scoring drive that essentially faced a prevent defense. That coverage approach put the onus on the Vikings’ front six or seven defenders to contain the run. They largely did. The longest run by a Lions running back came when cornerback Xavier Rhodes was hobbled and unable to change direction with LeGarrette Blount, who bounced to the outside for a 7-yard gain. 5. The Vikings’ D-line took Stafford’s checkdown out of the picture. Riddick had a team-high 8 targets, but Stafford would’ve looked his way even more in the second half had Riddick not been required to chip and block a destructive Vikings defensive line. On sack No. 10, Riddick missed the chip on Hunter and fell, leaving Stafford with no outlet on 2nd-and-10 in the red zone. Holton Hill and Jayron Kearse played great man-to-man coverage on Marvin Jones and T.J. Jones, taking away Stafford’s first reads before Hunter got sack No. 3.5 of the day. Hunter read a Riddick screen on the next play (3rd-and-18), forcing Stafford to lob it over the Vikings’ giant and landing in an incompletion.